Richard Jaquay, CE’63, was building a wastewater treatment plant near Tucson, Ariz., when he met his future wife. They made their first overseas trip together, to China, two years after they were married. 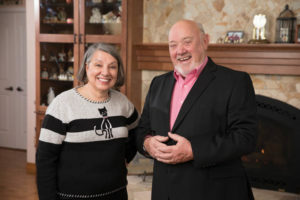 Richard and Barbara Jaquay have been on the move ever since, either relocating for work or pursuing their passion for world travel. Now retired in the Phoenix area, they are planning their next trip to the Basque Country. But that will have to wait until Barbara launches her new book, a history of sheep herding and ranching in Arizona. A geography scholar with a master’s degree from Arizona State University and a Ph.D. from Texas A&M University, Barbara has taught in six states — a nomadic career necessitated by Richard’s frequent moves. While frequent moves were a fact of life throughout Richard’s 39-plus year career with Black & Veatch, the Jaquays didn’t put their feet up when they had time off. Across 40 countries and every continent, they pursued their passion for adventure. Along the way, they also gave back to Missouri S&T as supporters of the Miner Alumni Association and civil engineering program. Now, through their planned gift establishing the Richard and Barbara Jaquay Rolla Rising Scholarship, they have chosen to make a difference for generations to come.